I am a little worried that I have written too many controversial post lately, so I wanted to take the easy road tonight and blog about a topic universally accepted. That is an unbiased research based ranking of the US Military branches. I figured this topic would cause little controversy as all can read it, nod, and sleep under the blanket of safety that the Marines provide for you. I also don’t want to be a complainer without a solution, so I will be giving suggestions for how the other branches can improve their rank. But before we get started, can we go ahead and agree to throw the Coast Guard out of the discussion. I mean I have never really been able to figure how the snuck their way into the Armed Forces category, but for time sake, lets just go ahead and move on past them. 1. Marine Corps – If you ever needed confirmation that the Marines are the best branch, just listen to how much all the other branches complain about the constant debate about Marines being the best. Notice the debate about the Army, Air Force, or Navy being the best is not even a common enough debate of which to get tired. Be the hunter, not the hunted. The Marines by just minding their own business are constantly getting injected into this debate. Marines have Fighter Airplanes that hover, craft that takes Marines ashore, and then the best part, the Actual Marines. Tradition is a big part. Ask any Marine the birthday of the Marine Corps and they will tell you. Ask the other branches, uhm not so sure. Again, this is just what the research tells me. I am an independent reporter of the facts. 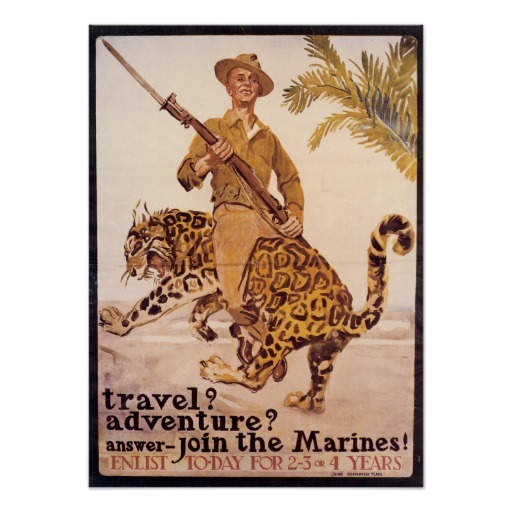 Also, the Marines have been known to ride leopards backward with bayonets fixed. Evidence above. What can the Marines do to improve their rank? – Become Space Marines. Fight Aliens in outerspace. Thats about all that’s left. 2. Navy – I’ve looked over the research and the research consistently says, You guys are soooo LUCKY you have the Navy Seals. I mean without them, your rank is probably down a couple of notches. But you do, so here you are at number 2. The other thing you have going for you is that you often are associated with Marines. Cool by association is an evidence based approach to improving your rank. You had the whole World War 2 thing going for you where you all were pretty tough, but that ship seems to have sailed. Navy Seals, well they get to do cool stuff like Shoot Bin Laden in the face. What can the Navy do to improve their rank? – Actually sink a ship. C’mon man, when was the last time you guys actually sank an enemy ship. They should change the game battleship to where only one side has ships. I’m looking for you guys to sink an enemy ship. Good ole turrets ablazing, Master and Commander style broadside. Sink a ship and you are good to go. Seems like a reasonable task to request of the Navy. 3. Air Force – Airplanes are cool guys, they really are. In a pinch, some good old fashioned air power is helpful as well. However, you are the new guys on the block only having been around 50 years or so. WW2 I believe it was called the Army Air Corps or something like that, but that gives the Army credit. Man, if you guys could have been born 15 years earlier, WW2 would of been one heck of a coming out party. The research gives you credit for Nukes. You got Nukes, lots of them. Huge Silo’s of Nukes, nukes on planes, and probably nukes on some secret satellite. But since your inception, you haven’t gotten enough big war action. What can the Air Force do to improve their rank? – Shoot down another plane. Kind of like the Navy, when was the last time you shot down a plane. Fighter pilot style. I think the Gulf War had some hot plane on plane action, but you need to get back in the game. Hopefully a looming War with Russia will give you that chance. You could shoot a nuke, that would be cool to, but there might be some unintended consequences to that. 4. Army – The research says the Army is cool. However, with their constant comparison to Marines, the game is already set to lose for them. As said in the above Air Force section, planes are cool, however, I don’t think you really have any. Marines got em. Navy got em. Air Force got em. Army, sorry guys. Maybe you have some planes, but no one really associated you with them. What you do have on your side is numbers. But doesn’t that kind of just make you common? Sorry Army, I appreciate what you do and my Army brother and Nephew are sure to love this, but facts are facts. I don’t make the data, I just report it. What can Army do to improve their rank? Be special. I mean your kind of like Emmit from the Lego Movie. Just saying. So truthfully, all Vets appreciate one another, but without lists like this, what fun is to be had. Oh and if any Navy Seals or Delta Force have a problem with this list then I want you to know that I am really really really sorry. Like Seriously, I was just kidding.